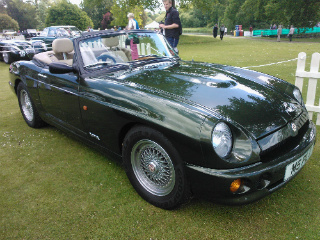 The MG RV8 sports car. Following the demise of the MGB in 1980, Rover decided to revive the MG brand name by redesigning the original car to produce what they felt would be the ultimate MGB. 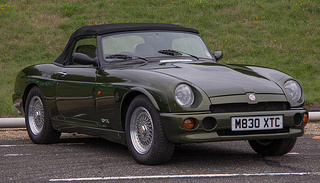 Furthermore, the concept of the RV8 was conceived in 1988 after British Motor Heritage began production of new MGB body panels. In 1989, Mazda launched the MX-5, which rekindled demand for smaller sports cars. As a result, using new body panels, MG decided to set in motion the redesign of the MGB. 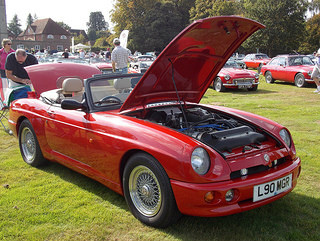 The body styling of the RV8 was such that it represented a departure from the MGB's initial design, and yet still retained the look and feel of the original car. 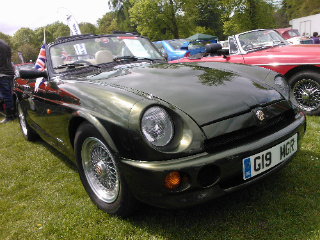 Hence the MG RV8 was born. The engine chosen was the 3.9 litre, 16 valve, fuel injected, V8 version of the Rover 3.5 litre V8 unit, as used in the MGB GT V8, with a compression ratio of 9.3:1. The rear leaf springs, boot lid, doors and rear drum brakes were all retained, whilst the suspension was slightly undated. A limited slip differential was fitted to ensure that all the power was not allocated to just one rear wheel, and that both wheels received powered motion. Although only 5% of the components of the 1962 MGB were used in the production of the new car, it was still reminiscent of the original. 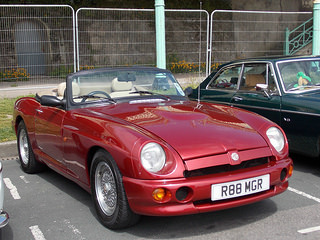 The MG RV8 was launched at the Birmingham Motor Show in 1992, as a two door, two seater convertible, and was targeted at established enthusiasts who would welcome the revival of the MG marque. The build quality was excellent, and it was the first body shell of any MG to be galvanised, and the first MG to have a fitted mohair hood. The cars' interior was to such a high standard, with leater and Elm veneer for the dashboard and door panels, that the press nicknamed it "The Poor Man's Rolls Royce". However, Rover faced a problem in that the £26,000 price tag was way above what the target market was willing to pay. The selling price of the RV8 was pitched at a premium to take account of the fact that the supply of body panels would never exceed some 15-18 per week, which meant that the car could only be regarded as a low volume, specialist entity. It was designed, not for volume production. 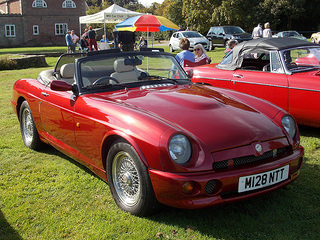 but simply to re-establish the name of MG in preparation for the launch of other volume convertibles, such as the re-launched MGF. Consequently, rather than abandoning the project, the car was presented at the Tokyo Motor Show in 1993, where it was an immediate success. So much so, that over 1,400 of the RV8's were immediately ordered. 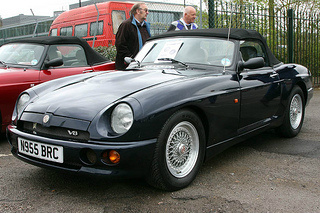 When reviewed at the time of the launch, the MG RV8 was regarded as being rather old fashioned, since it still retained a solid back axle and rear drum brakes, inherited from the original MGB. When production ended two years later in 1995, only 1,983 cars were built, of which 1,583 were exported to Japan alone. It is interesting to note that, during the period 2000 to 2010, as many as 700 of these Japanese exported sports cars were re-imported into the UK and Australia. 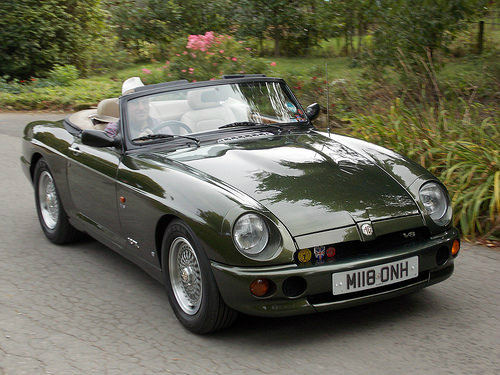 A 1993-95 MG RV8 in average condition would fetch around £10,000/$16,000 to £12,000/$19,000, whilst an excellent example would command around £17,000/$27,000.